How does one change deeply ingrained habits? Well, I’m not a fan of Facebook, but to give it credit, Facebook has successfully structured a system to feed off our deepest self-centered desires and alter our habits. There is much evidence in people’s posts and comments to show that many users are not honest with themselves about why they use it. Many parents post photos with “I’m so proud of my child!” When what they really want to say is “Look at how my child is probably more talented than yours!” And if you dig a little deeper, they really mean “I’m probably a better parent than you!” Even encouraging comments or Likes, are designed by Facebook to be important tools in the “Me Machine”, used to be promote oneself as a nice person and yet further increase recognition amongst peers. My focus here is not Facebook itself but the fact that to encourage behaviour of any kind, you must provide a structure, tools, rewards, and regular practice. Many people are troubled by world events and politics over the last 2 years and feel ethics and empathy are both being challenged or indeed forgotten. Facebook has been blamed for developing “echo chambers’ where people don’t get to hear and debate contrasting views. Teachers can help in this battle against balanced debate. We need to consider what classroom tools we might have that provide regular behavioural structures that overtly develop empathy and ethical thoughts. The reason I’m focusing on structures and tools is that you can’t teach empathy and ethics without context and real experience. Learners need tools and routines that ensure considering others is always an integral part of all learning activities. Stage 1: All initial ideas have value and might directly or indirectly spark improved outcomes. Stage 2: A significant time empathising with the recipients of the outcome means a much successful project. 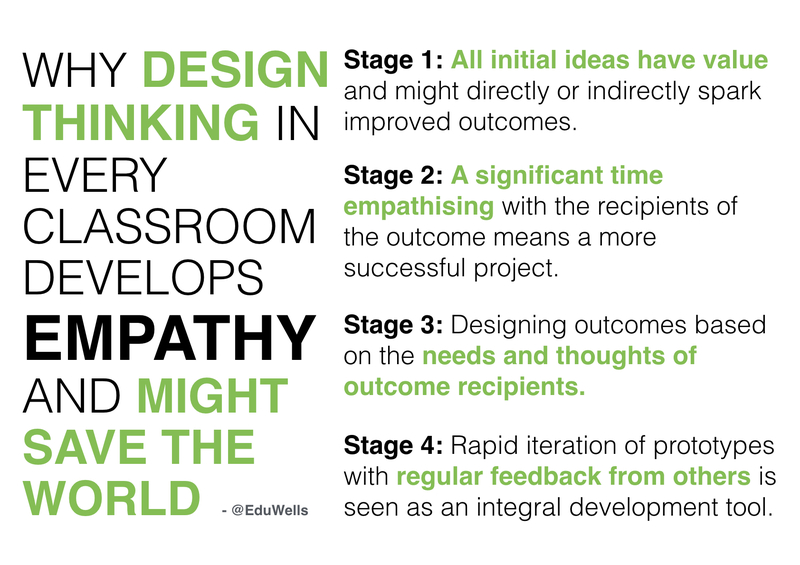 Stage 3: Designing outcomes based on the needs and thoughts of outcome recipients. Stage 4: Rapid iteration of prototypes with regular feedback from others is seen as an integral development tool. 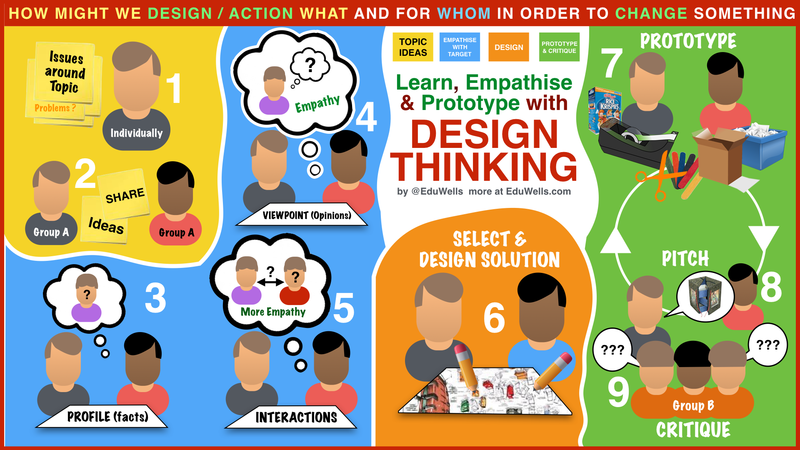 If used regularly, Design Thinking has the potential to alter mindsets by ingraining the idea that considering other people’s thoughts and experiences has social, emotional, and financial value. Through practical experience, it overtly teaches the fact that we are all better off if we consider and value all people on this earth.